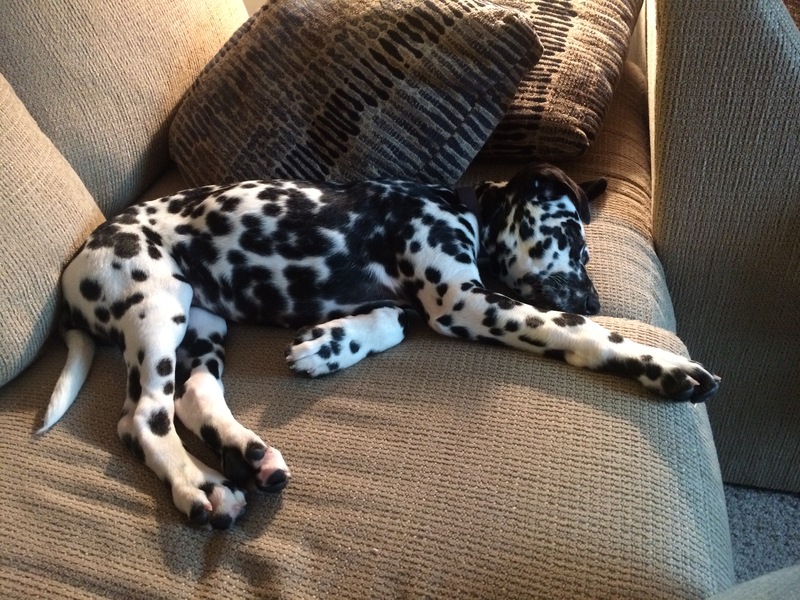 On October 21, third son and I picked up our new family member: an 8-week old Dalmatian we call Jasper. I have trained puppies before, most notably, a Dalmatian when I was young and impetuous. Now, I’m not so young but still pretty impetuous it turns out. There are those who say having a puppy is like having a baby: not true. The pre-dawn starlight holds a special kind of magic, a sort of contemplative radiance that helps a person consider her life in a different way. I had gotten in the habit of rarely seeing the sunrise – not so any more, and it’s a good thing to do from time to time. Mitigating the play between a puppy and a five year old cat is not unlike managing any number of modern relationships: the play can become hurtful, and then an adult has to step in. It’s okay to take a break if needed – just remember to always snuggle at the end of the day. Puppies do not come housetrained. Walking in the cold fall rain is not romantic. Maybe summer rain will be different. A part of my heart had been dormant, and the first time Jasper fell asleep in my lap that part awakened. It’s a good feeling. Addendum to #1: pre-dawn snowstorms also have a certain kind of magic; I’ll let you decide what kind. If you have misophobia, a dog is not for you. Dalmatians are open-minded about their diets; they eat everything: leaves, mud, kleenex, snow, pencils. We have to keep rescuing Jasper from his appetites, but I really should consider trying some new things – maybe not mud, though. Sleeping is best when one can snore slightly and not feel badly about it. Looking at the world from the point of view of someone who has never seen things before is good for the soul and attitude. Jasper burrowed in the snow; he delights in apples; the sound of geese flying overhead confuses him (he never thinks to look up). Regardless of housetraining mishaps and early morning barking, this impetuous decision called Jasper reminds me to keep trying new things – to keep seeing with new eyes.